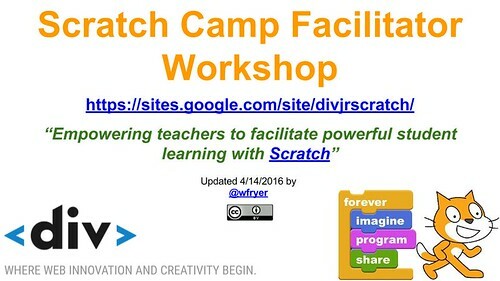 This Saturday, April 16, I’ll be leading a “Scratch Camp Facilitator Workshop” from 9 am to 1 pm at the Casady School in Oklahoma City. This FREE, hands-on workshop for educators is sponsored by The Div (@thedivorg), a non-profit based in Edmond, Oklahoma, focused on providing coding experiences for students. If you’re interested in attending, we still have room if you register online. The Div will be organizing summer coding workshops for kids, and workshop participants may have paid opportunities to facilitate/lead these workshops/camps in Oklahoma. I’m getting a little more skilled in my use of Google Sites these days, and included a dynamic “table of contents” for the workshop resource page at the top of the first content column. I included a variety of Scratch-related videos in the second column, including this new 30 second ad for Scratch from Cartoon Network which Mitch Resnik (@mres) tweeted about on Thursday.